This year we chose the second week in December (a Tuesday night to be exact) to go look at Christmas lights. That timing choice coupled with going right after dark (6pm) meant that we did not have to deal with any traffic at all. It was wonderful. We went at our own pace and didn't have to bother with hardly any cars. We went to the same neighborhood as the past few years just a few minutes from our house that is famous for their Christmas lights. The boys had hot chocolate (warm chocolate milk) in their cups to take along for the viewing. They also each chose a friend to go with them...Ethan took his deer that my mom and I brought back for him from Asheville and Logan took his new Rudolph that he made at Build a Bear. I love this year's Christmas PJ's (this is just one of them...I can't stop with just one set of Christmas PJ's) and moose slippers. 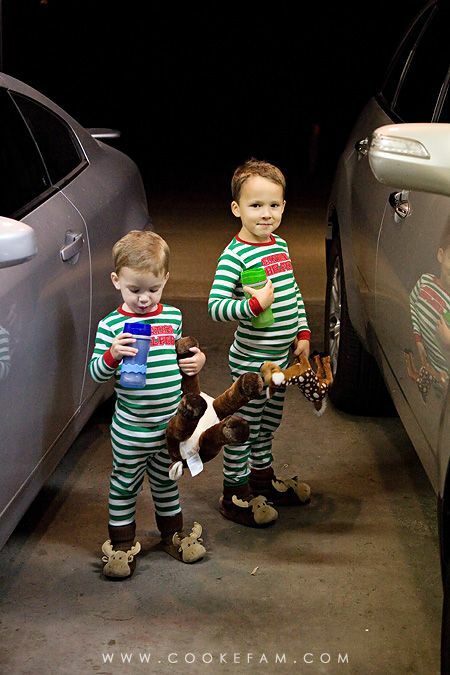 As long as they will let me, I will buy them matching PJ's. The boys absolutely loved the lights. They were yelling, "Christmas liiiights" as we would turn every corner. They were so excited. We rolled down their windows and cranked the heat so they could see a little better. And because there was little traffic, we got to see more of the neighborhood this time. 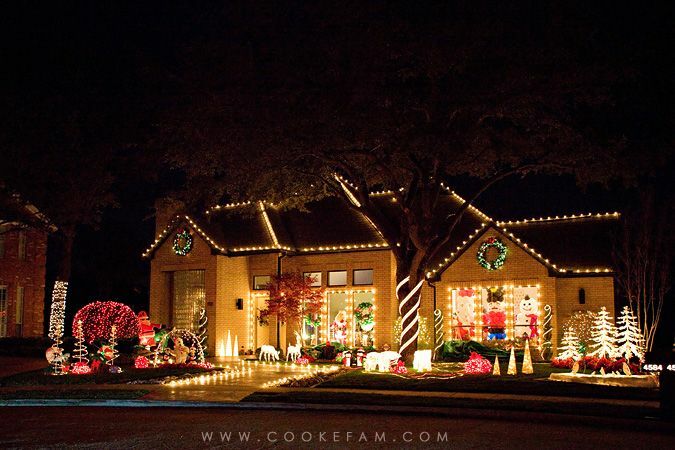 We saw a lot of the same houses we saw last year, so I won't share all the same photos again. 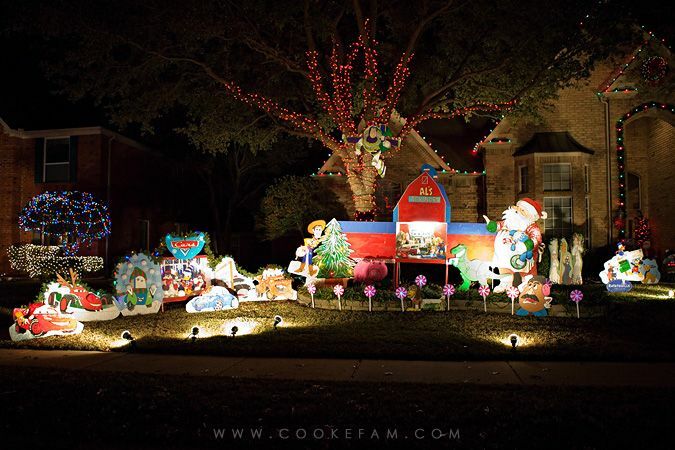 This house, with all the Disney and Pixar wood cut-outs, was a favorite again this year. The boys had the best time picking out all the characters they saw. 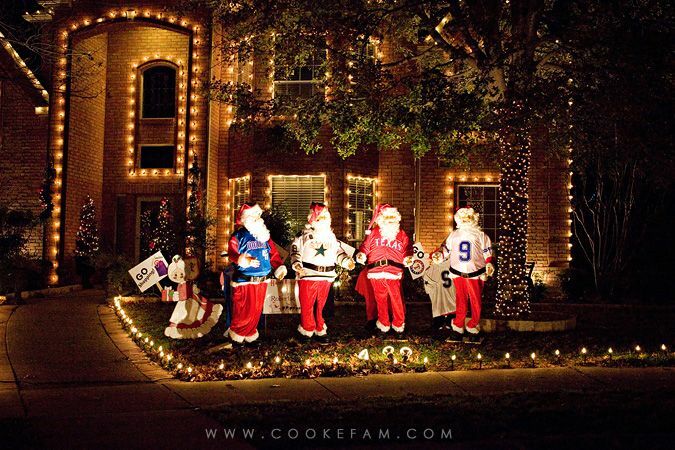 And this house, with the four dancing Santas each wearing a Dallas team's jersey, was fun too.